Carmel College, Auckland: Daragh Bonnici (Y7) has been selected from over 600 dancers nationwide for a child role in the Royal NZ Ballet production of The Nutcracker this December. Ava Fitzgerald (Y9) represented NZ at the Perth International Gymnastics Championships. She won a gold medal for her floor routine, a Bronze medal for beam and a Bronze medal in the all-round competition. She achieved the highest overall score for Level 9 which helped her team to achieve the Gold medal in the teams competition. Sionann Murphy won 50m Breast Gold, 100m Breast Gold and 100 Free Silver at the NZSS Swimming Nationals. Tayla Dalton has been selected for the Junior Tall Blacks (U19) team and will compete at the World Cup Qualifiers. St Mary’s College, Auckland: Lola Key (Y13) has been selected for the women’s IRB (inflatable rescue boat) team to represent NZ at the Lifesaving Championships. At the NZSS Swimming Championships, Kyla Anderson won the Gold medal in the Girls 16-18 years 100M Backstroke, a silver medal in the 50m Freestyle and a bronze medal in the 50M Butterfly. At the Cycling NZ events Ally Gothard won the NZ Time Trial Championships and the NZ Hill Climb Champs for U15 Girls. She also won the overall U15 Girls Northern Tour title. Baradene College, Auckland: Emma Blackmore won 1st place U13 at the NZSS Duathalon Championship. Rhea Patel won gold at the NZ Archery National Indoor Tournament, Ann Anson won silver and Seoha Kim won bronze in the same age group. At the 2018 Oceania and Australian Cross Country Championships, Natalaya Carter placed 15th overall and won a gold medal in the U18 cross country team event and gold in the U20 5 x 2km cross country relay. Ameila Bray (Y7) placed 1st in the Individual Event at the Intermediate Champion of Champions Artistic Gymnastics Championship. The Y7 Girls team placed 1st overall in the teams event (Amelia Seccombe, Grace Greaney, Samantha Ratcliffe, Amelia Bray). Kate Vernal competed in the 18 & Under NZ Junior Women’s Inline Hockey team at the FIRS Inline Hockey World Championships. The team finished the tournament in 6th place. Baradene College Football 1st XI won the National Championship in Football at the NZSS Lotto Premier Football tournament. 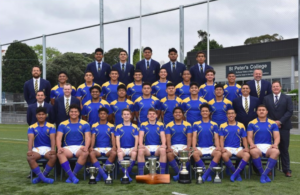 St Peter’s College, Auckland: St Peter’s College, Auckland have been crowned National First XV Championship in Rugby and they also hold the Moascar Cup. Sacred Heart Girls’ College, Hamilton: Nikita Toia has been selected for the NZU17 softball team. Lucy Lowe won the 125 Years of Women’s Suffrage Writing Competition organized by the Hamilton Branch of the National Council of Women. Her essay, about why the voting age should be lowered to 16, was presented at the Suffrage 125 Function in Auckland. Aylish Waldron (Y13) received a High Distinction award in the NZ Economics Competition. St Mary’s Catholic Primary School, Hastings: Lucia Urquhart received Second Place in the nationwide William Pike Challenge Award Short Story Writing Competition, and received a $1000 Leadership Scholarship for Sacred Heart College for 2019. St John’s College, Hastings: David Ivory, Head of Department, Commerce has been named a finalist in the NZI Sustainable Business Network Awards 2019, for leadership of the Social Enterprise Programme based on students’ work with inmates and those with mental health issues. Sacred Heart Girls’ College, New Plymouth: Laura Griffiths won the National “Play it Strange” competition. Charlotte Askin competed in the World Archery Youth Games, Oceania and placed 4th in Oceania in her age group. The NZ 18 & Under Junior Women’s Inline Hockey team competed at the World Championships and finished 6th. Danelle Sadler and Jorja Rosser, were part of this team. Niamh Quinn was selected to represent NZ at the 2018 Oceania Championships. Alix Blyde, Caitlin O’Connell, Tiaan Owen, Emily Poole, Raquel Sampson and Gemma Walsh were members of the Taranaki Basketball U17 girls’ team which won the gold medal at the National Basketball Championships. Sasha Reid has been selected for the Junior Black Fins to compete at the Lifesaving Word Championships. Hannah O’Connor has been named in the NZ Athletics team to compete in the World Youth Olympics in Argentina. Francis Douglas Memorial College, New Plymouth: Future Problem Solving (FPS) is now a timetabled option class at Years 10 and 11 at Francis Douglas Memorial College. Two components of FPS are offered; Global Issues Problem Solving and Community Problem Solving. Students can choose either option as they run concurrently for the full school year. Flynn Barrett was awarded Excellence, (98th percentile) in the University of Canterbury Kiwi Science Competition. Jacob Ratumaitavuka-Kneepkens has been selected for the NZ Fiji Schools Sevens training group for 2018. This squad is to prepare for the World Schools Sevens Competition, to be held in Auckland and Fiji. 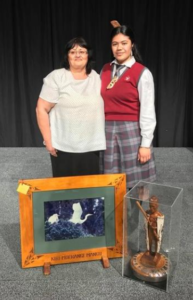 Sacred Heart College, Lower Hutt: Tuimaleali’ifano Fiso came 1st in Senior English Impromptu Speech and was Overall Winner of Senior English at the National Ngā Manu Kōrero Speech Competition finals. The Royal Society of Te Apārangi has selected Y12 student Gianna Lill to attend the National Youth Science Forum. This is a 12 day immersive science experience. The programme consists of a mix of scientific, formal, personal development and social activities. All aspects of the programme contribute to one of the central strands: STEM in action, STEM in society and the next generation of STEM. Olivia Gibbs (Y11) was in the Capital Futsal team that won the National Championships. 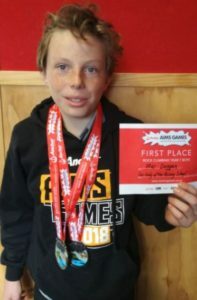 Our Lady of the Rosary School, Lower Hutt: Mac Duggan placed first overall at the AIMS Games in Rock Climbing for Year 7 boys. 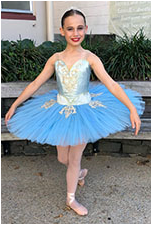 Annabel has been selected to dance in the Royal NZ Ballet production of The Nutcracker. St. Patrick’s College, Kilbirnie, Wellington: Josh Wypych (Y13) was a member of the Capital Hockey team that won the National U18 title. Max Karamanolis (Y13) has been selected into the NZ Cross Country team to compete at the Australian Championships. Jackson Manual (Y11) has been selected in the NZ U17 Football team to play in the Oceania tournament in the Solomon Islands. Cam Fitzgerald-Little and Caleb Ward have been selected in the NZ U19 Floorball team to contest the Oceania World Cup qualifying tournament. Garin College, Nelson: Helen McKay won two gold medals, 3 silver medals and 1 bronze medal in the para events at the NZSS Swimming championships. 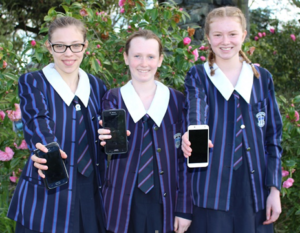 Villa Maria College, Christchurch: Paris Wadle, Sarah Williams and Leonie Stauder (Y10) won the National Tech Girls are Superheroes competition with their app called Bi-schooling. The competition challenge students to create apps to solve problems or issues in the community. The bi-schooling app helps children who would like to bike to school to find others to bike safely together in a group, and identify the safest route. Roncalli College, Timaru: Jaxson Whyte won all four stages at the cycling Southern Tour U15 time trial, criterium, hill climb and road race. The Criterium was a National title, he also won awards for king of the mountain, sprint ace, and overall tour leader. Kavanagh College, Dunedin: Erika Fairweather represented NZ at the Junior Pan Pacific Games in swimming and broke two NZ age group records in the 200M and 400M Freestyle events. At the National RoboCup competition Tobias Devereux (Y10) was part of a two man team took out 1st place in the Premier Theatre section and also won a programming Prize. 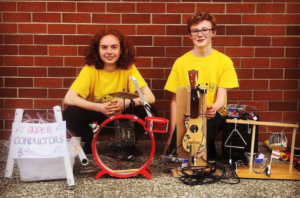 Their robot entry (titled “Superconductors”) included five different instruments – synth bot, drum bot, percussion bot, ukulele bot, and pipe bot, programmed to play a selection of songs. Ryan Novilla (Y5); Medal for top year 5 student in NZ and Pacific.